Add fun and flair to your spring and summer entertaining this year by bringing edible flowers to the table. But don’t limit them to pretty centrepieces – add them to your favourite warm-weather dishes. 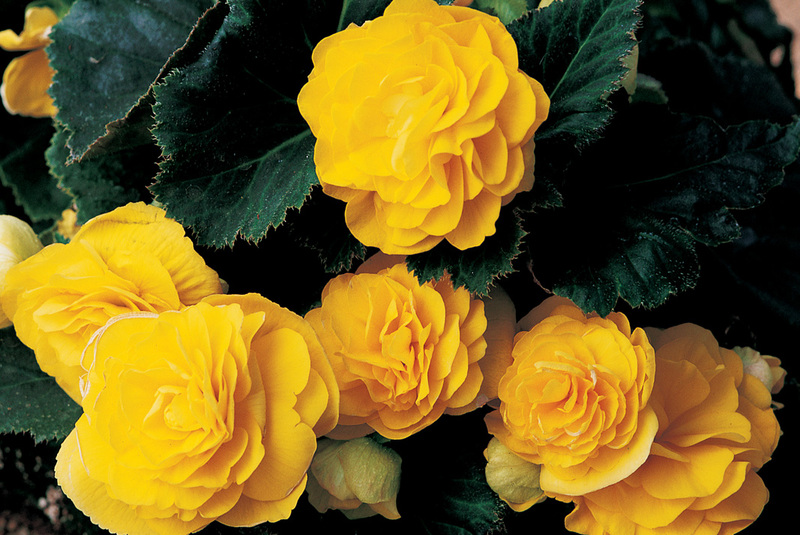 We’ll all be trooping off to garden centres this month to choose new things for our gardens, so put some pretty, edible flowering plants on your shopping list. They’re a win-win deal – nice to look at as they grow and amazing additions to your plate. They’re versatile, too. You can plant them out in your flower beds or use them in containers, either alone or mixed with other favourites. You may already have flowers in your garden that you can toss into salads or sandwiches. Some basics about preparation: Use flowers that haven’t been sprayed with artificial pesticides. Wash them well (because of creepy crawlies) and pat dry. In general, use individual petals, not whole flowers, which can be an overwhelming mouthful. And taste a bit first to check for allergies. Tuberous begonia petals have a light citrus flavour. Tulips – Use instead of veggies with creamy dips; Stuff whole ones with mixed soft cheese (pull out the inside flower bits first); try the petals as a base or topping for appetizers on crackers or spoons. Violets (wild) – They tend to be sweetish, so they’re pretty on desserts as well as in salads and sandwiches. Redbud (Cercis canadensis) – Add the tiny flowers to cooked veggies or salads before serving. Lilacs – Mix into soft cheeses and yogurt or sprinkle on dessert as a garnish. Roses – They’ve been eaten for centuries. Add to sugar syrup for cakes and ice cream or layer in homemade jelly; make into rosewater for candies and desserts; use petals plain or crystallized as a garnish; flavour sugar with them to use in teas and baked goods. Bee balm (Monarda didyma)– This native plant is beloved by pollinators, but you can nip off a few colourful petals to add to cold drinks, as well as salads. Lavender – Another old-time edible to use in teas, lemonade, ice cream, baked goods and herbes de Provence seasoning mixture. The flowers of all culinary herbs are edible and taste like a milder version of the leaves. My own favourite is sage flowers, which have a sweetish, sage flavour. I like them as an in-garden snack, but they’d be good with eggs or with pork braised in white wine. Pretty summer annuals that bloom madly all season long can be used creatively to add sparkle and delicate flavours to light summer food. Again, petals are easiest to use. Keep blooms coming by feeding regularly with organic fertilizers and making sure plants are well-watered, but not soggy. 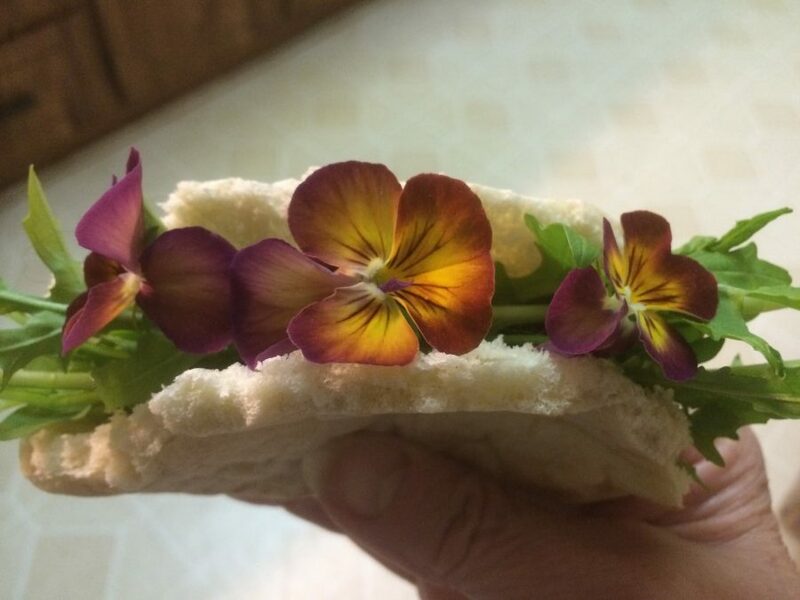 Pansies – The smaller, delicate ones are lovely in sandwiches with other greens and are favourite salad sprinkles. Nasturtiums – Young leaves of some varieties are tender enough for to eat fresh, and the flower petals are classic tangy additions to salads and sandwich platters. Marigolds (Tagetes) – Many are bitter, but ‘Lemon Gem’ adds a subtle citrus touch to salads and strong-flavoured vegetables. Dianthus/pinks – These look like little carnations and have a spicy/clove taste that matches their scent. Annual flowers, with their short summer lives, are wonderful in containers on patios, porches or even as a point of interest in the garden. Add some lush edible greens for a dramatic planting that satisfies the eye and the appetite. Mix in tasty arugula, colourful lettuces, crisp parsley and lacy dill and mini-carrots. Betcha no one will recognize your veggie patch unless you tell them! There is still time to enter the no-guff spring garden contest. Email beachgsblogger@gmail.com by midnight May 19 with the subject line “no-guff contest” (include your name, address and phone number) to be entered into a draw to win a copy of No-Guff Vegetable Gardening by Donna Balzar and Steven Biggs. The winners’ names will be published in the May 30 issue.